Because most beginners are starting on a strict budget (we’ll see how long that lasts), I am making the list as economical as possible. As you gain confidence, you can expand into more expensive selections. Besides, like wine, the nicest Neo selections aren’t necessarily the most expensive. I have broken down the list based on what I see as the basic categories. While it’s tempting to get as many different varieties as you can afford and buy just single growth plants, I would encourage you to buy, as much as possible, at least two growth plants. They will grow much faster and be healthier because they will have more developed root systems. I wouldn’t sell a single growth plant that I didn’t think was healthy and viable on its own, but eventually everyone comes to the same conclusion that it’s better to spend a little more up front. It’s not even a matter of how soon it will bloom (most of the single growths are blooming size), it’s really just general well-being of the plant. When a single growth costs $150, then by all means, just get one, but if it’s $10/growth, bite the bullet and get at least a double. Please feel free to contact me with any Neo questions you have, and I will be happy to answer the to the best of my ability! I bought an orchid from you at Meijer Garden show, it is growing a little but also losing leaves, only 2 at the bottom. I was gone for 8 days and husband took care of it he did well misting it. It seems to like soaking in water which you told me to do. we live in Northern Mich. but I have a good window for orchids. Hope I can get it to flower. Dear Kim, I remember you! STOP watering. It’s important that Neos (I’m assuming it’s a Neo…?) dry out completely between waterings. No misting. Or you can mist and not water, but do not let it stay damp. I know it’s dry in our houses right now, but that’s okay. When the plant is crispy dry, you can soak it again. For now, leave it alone for a week or so, and let it get a good rest. One of my friends who once had many large and beautiful Neos lost them ALL when he started misting them regularly as he had been advised by someone (not me!). Most orchids would rather stay dry a day too long than wet a day too long. Keep that in mind. 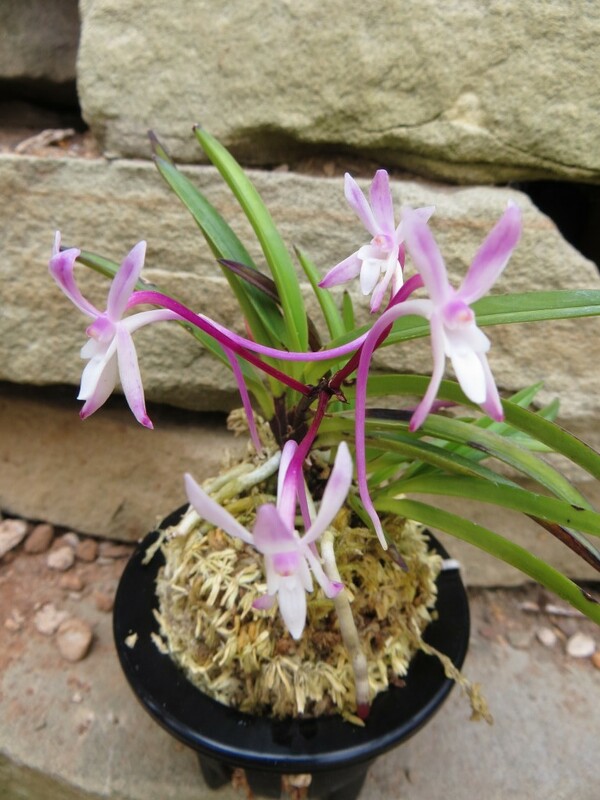 Now if it’s something other than a neofinetia, I may have different advice, so if my assumption is wrong, let me know. I was wondering how you ship your Neo’s. Are they bare root or do you pot them up? If you pot them up, do you do them in the traditional Japanese style? I just ordered the book you have on Neo’s. Can’t wait to look at all of those beautiful babies. I know it is in Japanese, and I won’t understand it but it looks so beautiful. Correct me if I am wrong, but I think it has English names. We ship plants year round as long as the mail is still running and it’s not in the negative numbers (like it was this last week). For added protection, we do add a heat pack in this much cold. Unless otherwise instructed, I ship plants potted Japanese-style in 3-footed black plastic fukiran pots from Japan. Just wondering if my book has been sent yet? Hello! I purchased an orchid from you at the Cleveland Botanical show in February. It grew beautifully over the winter, spring and summer. For the past 2 weeks, it’s gone from 11 leaves down to 1! Still green, the leaf just drops off. I have been misting it once as day as told, but wonder if it needs more in this hot, dry weather. Please advise- l’ve enjoyed it hanging in our bathroom, out of direct sun. It even flowered in the spring! Many thanks. I’m curious about what should be expected for good healthy Neofinitia growth. For example – I know “in general” if my Neo’s are loosing leaves this is NOT good. However, I assume (?) it is normal to occasionally loose a leaf. If this is true, and I’m assuming anyone growing the numbers of plants that you do would know, what time of year would a Neo typical shed a leaf or two? Also, regarding new leaf growth or new fan starts – I’m assuming one would expect to see these during the spring when one starts to also see new root growth tips (or perhaps a little later in the summer)? Thanks! Great questions! Usually Neos will lose a leaf where either a new growth or a new root are coming out. That’s nothing to worry about. This time of year, I tend to see a couple bottom leaves turning brown or yellow and coming off, and that doesn’t worry me (because I’m almost certain new growth will turn up there). More than that, and you might be under-watering. The leaf you don’t want to turn brown is the top center leaf. While that usually spells the end of that particular fan (but not always), new babies almost always pop up around the doomed growth. This is the time for new growths to start to appear, and they can continue popping up all through the summer. I have found that hot temperatures are very welcome to Neos as long as they get sufficient water. Also, don’t forget to feed them at this active growth stage! I have found that supplemental calcium has significantly decreased center leaf loss; this may not be a problem if you have hard water. 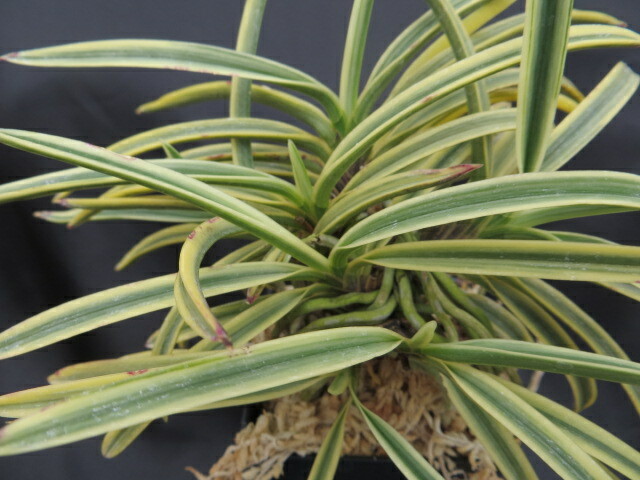 I recently purchased a Neostylis “Lou Sneary” at the Rutgers show in NJ. I’m seeing black areas on the leaves. Is it from too much water. I’m currently watering every 3rd day. Misting too when the furnace runs a lot. Hi Joe! I think we talked at the Deep Cut show, but depending on what it actually looks like, it could be sunburn or it could be some fungal/bacterial spotting. If it’s dry in your house, I tend not to think it’s the latter. If you send me a picture (you can text it to me at 734-369-1776), I will be able to do a much better job of giving you a good answer. It’s sounds like you’re doing everything right.